Janey had a 102.8°F fever, difficulty of breathing, and drooling. She also always sits on a tripod position because this position makes her breathe easier. Her parents brought her in for a check-up and was informed that their child has epiglottitis. Acute epiglottitis and associated upper airway obstruction has significant morbidity and mortality and may cause respiratory arrest and death. Epiglottitis is acute inflammation of the epiglottitis. 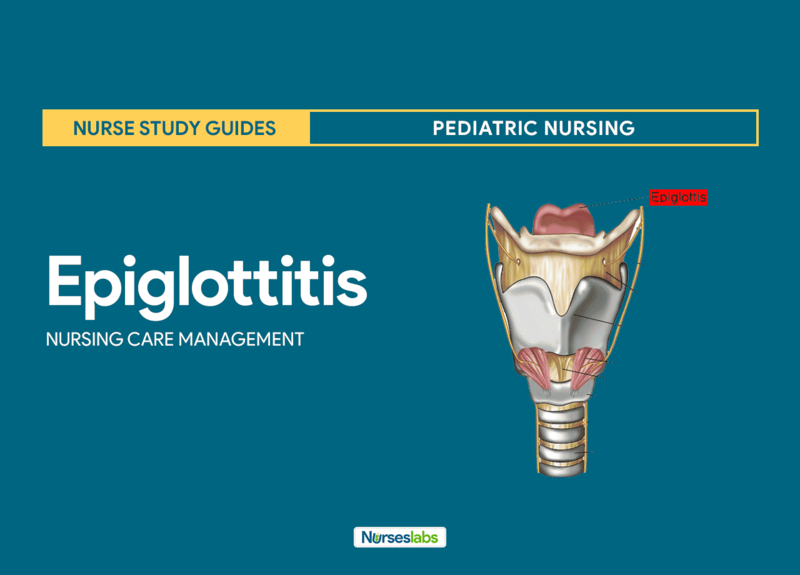 Epiglottitis, also termed supraglottitis or epiglottiditis, is an inflammation of structures above the insertion of the glottis and is most often caused by bacterial infection. Affected structures include the epiglottis, aryepiglottic folds, arytenoid soft tissue, and, occasionally, the uvula. The epiglottis is the most common site of swelling. Haemophilus influenzae type b (Hib) or Streptococcus pneumoniae can colonize the pharynges of otherwise healthy children through respiratory transmission from intimate contact. The epiglottitis becomes inflamed and swollen with edema. Hib infection of the epiglottis leads to acute onset of inflammatory edema, beginning on the lingual surface of the epiglottis where the submucosa is loosely attached. Swelling significantly reduces the airway aperture. Edema rapidly progresses to involve the aryepiglottic folds, the arytenoids, and the entire supraglottic larynx. The tightly bound epithelium on the vocal cords halts edema spread at this level. Frank airway obstruction, aspiration of oropharyngeal secretions, or distal mucous plugging can cause respiratory arrest. The use of the Haemophilus influenzae type b (Hib) vaccine has reduced incidence of epiglottitis in the United States, making this a rare condition in children. Studies have shown an annual incidence rate of 0.63 cases per 100,000 persons, and studies of children of all ages with epiglottitis report a seasonal variation in incidence. A retrospective case series of 107 patients admitted to a pediatric hospital’s intensive care unit (ICU) from 1997 to 2006 concluded that bacterial tracheitis is now 3 times more likely to be the cause of pediatric respiratory failure compared with viral croup and epiglottitis combined. The international incidence of epiglottitis widely varies, with a significantly greater prevalence in countries without universal immunization. Among countries with mandatory immunization, the reported incidences are 0.9 cases per 100,000 persons in Sweden and 0.6 cases per 100,000 in the United Kingdom, for example. Most studies show no racial predominance for epiglottitis, although a recent study showed higher incidence among black and Hispanic individuals. There also appears to be a 60% male predominance, which has remained true even with the changing epidemiology of epiglottitis. Commonly caused by Haemophilus influenzae type B, epiglottitis most often affects children 2 to 7 years. Haemophilus influenzae. Historically, Haemophilus influenzae type b (Hib) was the predominant organism (>90%) in pediatric epiglottitis cases. Viral agents. Although viruses normally do not cause epiglottitis, a previous viral infection may allow bacterial superinfection to occur; viral agents may include herpes simplex virus (HSV), parainfluenzae virus, varicella-zoster virus (VZV), human immunodeficiency virus (HIV),  and Epstein-Barr virus (EBV); varicella can cause a primary or secondary infection often with group A beta-hemolytic streptococci. Non-infectious causes. Noninfectious etiologies include thermal injuries, trauma-causing blind finger sweeps to remove a foreign body from the pharynx, angioneurotic edema, hemophagocytic lymphohistiocytosis, and acute leukemia. The child may have been well or may have had a mild upper respiratory infection before the development of the symptoms. Fever. Fever is usually the first symptom, and temperatures often reach 40°C. Dysphagia. Dysphagia or difficulty in swallowing is one of the symptoms in the clinical triad. Drooling. Due to dysphagia, drooling occurs and is also one of the symptoms in the clinical triad. Respiratory distress. The last of the three symptoms in the triad, fever with associated respiratory distress or air hunger occurs in most patients. Tripod position. The child is very anxious and prefers to breathe by sitting up and leaning forward with the mouth open and the tongue out. Securing an airway is the overriding priority; an expert in pediatric airway management should always perform an endotracheal intubation on any child with suspected epiglottitis before radiography or blood work is performed. Laryngoscopy. Laryngoscopy is the best way to confirm the diagnosis, but it is not advised to attempt any procedures without securing the airway. Blood and epiglottis cultures. Blood cultures and culture of the epiglottis should be performed only after the airway is secured; blood cultures may show Haemophilus influenzae type b (Hib) between 12-15% and 90% of cases. Lateral neck radiography. Never obtain a lateral neck radiograph before achieving definitive airway control; if radiography is required, the safest procedure is to perform portable radiography at the bedside. Percutaneous transtracheal ventilation. Also termed needle cricothyrotomy or translaryngeal ventilation, percutaneous transtracheal ventilation is a temporizing method used to treat cases of severe epiglottitis when the patient cannot be intubated before a formal tracheostomy. Treatment in patients with epiglottitis is directed toward relieving the airway obstruction and eradicating the infectious agent. Manage respiratory arrest. When a child has respiratory arrest, the first step is to administer bag-valve-mask ventilation with 100% oxygen; once the child is oxygenated and ventilated, the airway can be secured with an endotracheal tube, cricothyrotomy, or tracheostomy; these treatments should prevent cerebral anoxia, arrest, and death, the most feared complications. Moist air administration. Moist air is necessary to help reduce the inflammation of the epiglottitis. Pulse oximetry. Pulse oximetry is required to monitor oxygen requirements. Endotracheal intubation. Once supplemental oxygen is provided, the next crucial step is to mobilize a team to establish an appropriate airway via endotracheal intubation; mortality rates for children who receive endotracheal intubation are less than 1%; children who do not receive intubation have mortality rates as high as 10%. Tracheostomy. If endotracheal intubation is unsuccessful, perform a tracheostomy with percutaneous translaryngeal ventilation used as a temporizing measure. Antibiotics. Appropriate antibiotics include ceftriaxone, cefotaxime, and cefuroxime (for nonmeningitic infections); as in all invasive Haemophilus influenzae type b (Hib) infections, contacts should receive rifampin chemoprophylaxis; for epiglottitis due to other organisms, antibiotics should be tailored to the cause of the infection. Corticosteroids. Corticosteroid administration, although advocated in the past based on anecdotal reports, remains controversial. Respiratory assessment. Assess the child’s breathing, any history of injury to the throat, breathing through the mouth, stridor, and hypoxia. Cardiovascular assessment. Assess the child’s pulse; assess for tachycardia and a thready pulse. Gastrointestinal assessment. Assess if there is an inability to swallow. Ineffective breathing pattern related to upper airway edema. Anxiety related to respiratory distress. Hyperthermia related to inflammatory process. Deficient knowledge related to lack of knowledge on the disease process. Patient and family will verbalize strategies to reduce anxiety. Patient and family will demonstrate an understanding of what has been taught. Patient and family will Verbalize understanding of condition/disease process and treatment. The patient’s temperature will be within normal range. The patient will maintain a patent airway. Anxiety control. The child and the family should display personal actions to eliminate or reduce feelings of apprehension and tension from an unidentifiable source. Learning facilitation. The nurse should promote the ability to process and comprehend information, and encourage improvement of the ability and willingness to receive information. Medications. Administer antibiotics as prescribed, such as cefuroxime. Hydration. Regulate IV fluid accordingly, since the child could not swallow. Patient and family verbalized strategies to reduce anxiety. Patient and family demonstrated an understanding of what has been taught. Patient and family verbalized understanding of condition/disease process and treatment. The patient’s temperature is within normal range. The patient maintained adequate ventilation and oxygenation. The patient maintained a patent airway. Responses to interventions and actions performed. Immunization of children with Haemophilus influenzae type B (Hib) vaccine decreases the incidence of which of the following conditions? Option C: Epiglottitis is a bacterial infection of the epiglottis primarily caused by Hib. Administration of the vaccine has decreased the incidence of epiglottitis. Option A: Bronchiolitis is usually caused by Respiratory Syncytial Virus (RSV). Option B: Acute LTB is of viral origin. Option D: The most common bacterial organisms causing pneumonia in children are pneumococci, streptococci, and staphylococci. Which of the following respiratory conditions is always considered a medical emergency? Option C: Epiglottitis, acute and severe inflammation of the epiglottis, is always considered an acute medical emergency because it can lead to acute, life-threatening airway obstruction. Option A: Asthma is a chronic disease; however, status asthmaticus and acute attacks require prompt treatment. Option B: CF is a chronic disease and is not considered an emergency. Option D: Acute LTB requires close observation for airway obstruction, but this condition is not always an emergency. Which statement is correct regarding the role of epiglottis? This structure prevents food from entering the nasopharynx. The epiglottis helps with vocal cord vibration. After swallowing this structure moves downward to prevent swallowed contents from entering the trachea. The epiglottis is found in between the vocal folds. Option C: The epiglottis is found on the inside of the thyroid cartilage and is at the back of the tongue. Option A is wrong because this is the role of the uvula. Option B is wrong because this is the role of the glottis. Option D is where the glottis is found. Option C: Most common cases of epiglottitis are caused by a bacteria that attacks the epiglottis called haemophilus influenzae type B. Options A, B, D: These options are incorrect; they do not cause epiglottitis. A 3-year-old arrives in the ER. The child has a temperature of 102.4°F and is agitated. 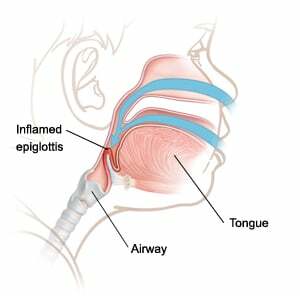 The child is diagnosed with epiglottitis. You note the child is sitting up, positioned forward with chin in the air and the tongue is protruding with the mouth open. Which nursing intervention below is not appropriate for this patient? Assist the patient in a supine position. Keep the child on the parent's lap during treatments. Avoid taking a temperature on the patient orally. Option A: Placing the child on a supine position is contraindicated because it impedes respiratory effort. Option B: A nursing goal is to keep the child calm, so keeping the child on the parent's lap during treatment is appropriate. Options C&D: Never place anything in the patient's mouth due to the risk of causing spasms which will further constrict the airway. 1. Immunization of children with Haemophilus influenzae type B (Hib) vaccine decreases the incidence of which of the following conditions? Option C: Epiglottitis is a bacterial infection of the epiglottis primarily caused by Hib. Administration of the vaccine has decreased the incidence of epiglottitis. Option A: Bronchiolitis is usually caused by Respiratory Syncytial Virus (RSV). Option B: Acute LTB is of viral origin. Option D: The most common bacterial organisms causing pneumonia in children are pneumococci, streptococci, and staphylococci. 2. Which of the following respiratory conditions is always considered a medical emergency? Option C: Epiglottitis, acute and severe inflammation of the epiglottis, is always considered an acute medical emergency because it can lead to acute, life-threatening airway obstruction. Option A: Asthma is a chronic disease; however, status asthmaticus and acute attacks require prompt treatment. Option B: CF is a chronic disease and is not considered an emergency. Option D: Acute LTB requires close observation for airway obstruction, but this condition is not always an emergency. 3. Which statement is correct regarding the role of epiglottis? A. This structure prevents food from entering the nasopharynx. B. The epiglottis helps with vocal cord vibration. C. After swallowing this structure moves downward to prevent swallowed contents from entering the trachea. D. The epiglottis is found in between the vocal folds. 3. Answer: C. After swallowing this structure moves downward to prevent swallowed contents from entering the trachea. Option C: The epiglottis is found on the inside of the thyroid cartilage and is at the back of the tongue. Option A is wrong because this is the role of the uvula. Option B is wrong because this is the role of the glottis. Option D is where the glottis is found. C. Haemophilus influenzae type B. 4. Answer: C. Haemophilus influenzae type B. Option C: Most common cases of epiglottitis are caused by a bacteria that attacks the epiglottis called haemophilus influenzae type B. Options A, B, D: These options are incorrect; they do not cause epiglottitis. 5. A 3-year-old arrives in the ER. The child has a temperature of 102.4°F and is agitated. The child is diagnosed with epiglottitis. You note the child is sitting up, positioned forward with chin in the air and the tongue is protruding with the mouth open. Which nursing intervention below is not appropriate for this patient? A. Assist the patient in a supine position. B. Keep the child on the parent’s lap during treatments. C. Keep the child nothing by mouth. D. Avoid taking a temperature on the patient orally. 5. Answer: A. Assist the patient in a supine position. Option A: Placing the child on a supine position is contraindicated because it impedes respiratory effort. Option B: A nursing goal is to keep the child calm, so keeping the child on the parent’s lap during treatment is appropriate. Options C&D: Never place anything in the patient’s mouth due to the risk of causing spasms which will further constrict the airway.